Ashraf, Gershman and Howitt (2013) simulate an agent-based model to try to answer the question. This basically amounts to building up an economy with a certain number of agents who work, trade and consume. The model also has a government and a central bank. Trading occurs through specialized “shops”, which are basically enterprises. This model is then simulated using computational techniques on a week-by-week basis. The workings of the model and a list of all the parameters included (25 in total) can be found in the paper, I won’t go into detail about them. But the parameters are calibrated to real-world values if they’re observable, or to values based on previous research if they’re unobservable. This model economy is then simulated multiple times for a large number of (10,000) 60-year periods. It is very interesting what the authors find. As the figures below show, there is something special about that 0-3% inflation range. A sensitivity analysis was also carried out by the authors. They basically perturbed all of their parameters by 25% in both directions, one-by-one. Then they measured by how much these perturbations changed the model’s key performance indicators such as output gap. 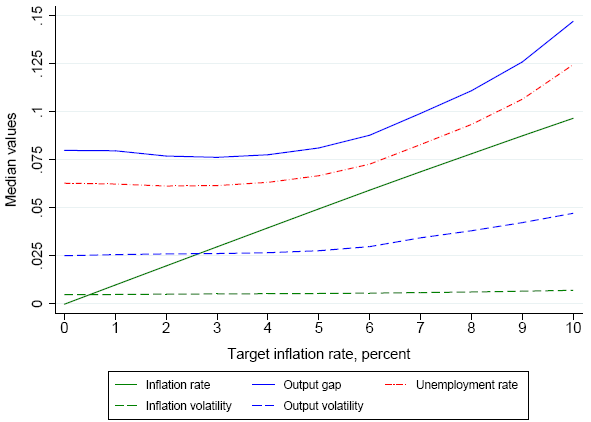 First, at all perturbations the general result of the model did not change: when comparing a 3% inflation to a 10% one, unemployment and the output gap were always higher in the latter case. Second, the authors could identify this way which variables drive the results behind their model. Some of the important ones turned out to be the mark-up of shops, the job search probability, the critical inventory-to-sales ratio and demand elasticity. Namely, a lower mark-up or job search probability and a higher critical inventory-to-sales ratio or demand elasticity will increase the output gap quite significantly. These effects all seem to make economic sense. A lower mark-up will potentially lead to fewer shops, fewer types of goods and lots of potentially beneficial deals not going through; a lower job search probability implies that the unemployed are less likely to find employment. A higher critical inventory-to-sales ratio basically means that firms will be willing to operate with higher inventories relative to sales levels, this could have detrimental effects from lowering profitability to inefficient production; finally a higher demand elasticity will make consumers more sensitive to price dispersion, an important variable as we’ll soon see. Our interpretation of the deterioration of macro performance when trend inflation rises above 3 percent focuses on the costs of maintaining the trading facilities that are necessary for economic transactions. 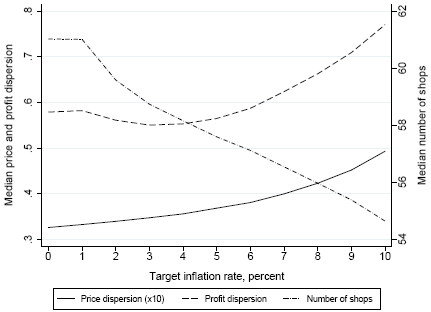 Specifcally, given that price changes are not perfectly coordinated across shops, an increase in inflation should create an artificial increase in the dispersion of relative prices, that is, an increase unrelated to tastes for consuming and technology for producing the wares of different sellers. This will clearly add to the volatility and unpredictability of demand faced by any seller, making it more likely that some sellers will be at risk of failure because of their inability to cover the fxed overhead cost. The result should be a reduction in the number of shops, an increase in the number of potential transactions that go unconsummated for lack of a trading facility, and, hence, a fall in the level of economic activity and a rise in the rate of unemployment. To me, it doesn’t appear that the authors’ model was specified in a way that it would deliberately generate this result. So it is in a sense quite fascinating that inflation has no effect whatsoever until it hits that 3% threshold. What is so special about that 3%? Is there some kind of an innate preference towards the maximum price dispersion economies can withstand without losing potential output? That 3% seems like such a clear-cut level. It is very interesting that such a threshold can arise naturally. This begs the question whether this special range itself is dependent on something, on some factors that exist in our economy and/or our aggregate behavior that may change over time. Or is it something that will potentially stay constant forever? What about deflation? Given that price dispersion was the main culprit for the bad results of the model, one could expect that inflation rates lower than -3% have similar detrimental effects to inflation rates above 3%. On the other hand, what about the -3% to 0% range. The authors only deal with this topic in a footnote, stating that they ran simulations for this range and that going from 0% to -3% increased the output gap by about 1.6% (to me this is negligible) and that unemployment rose by 1 percentage point (this is more problematic). My verdict is that if the model’s right, modest deflation is clearly not a huge threat, though it should not be the goal of any central bank. The authors also spend a section on trying to answer why cross-country regressions of GDP on inflation may find no significant effects. Simulating such regressions using their model, they determine that there is a 15% chance one does not find such a relationship significant even if it does exist. That 15% seems low but then again, in the real world data will be plagued by endogeneity issues, which are not a problem in the model. All in all, a decent paper showing some evidence in favor of the target inflation range of 0-3% that most (if not all) developed countries have adopted. Possibly, further research is necessary, however, to determine how this special range arises and whether it can shift over time. This entry was posted in Computational Economics, Macroeconomics and tagged agent-based modeling, inflation, output gap, simulation, unemployment. Bookmark the permalink.